rest of the text is not changed. some parts are set to another place for better understanding. - No Kimonos’s, karate/judo gi or gi like construction allowed. - OT’s should have a collar approximately 1 inch to 2 inches (5 cm) wide. - OTs overall length may be variable and may extend to the floor. - OT´s minimum length must cover crotch and buttocks. - OTs are generally made in a fashion where there is a full skirt (attached to the main body of the OT) where the seam is hidden by the obi. - Sleeves should hang at least to the knuckles when the arms are held down at the side. - OTs may be sleeveless as long as an Inner Tunic (IT) is worn and is long sleeved. No bare-armed Generic Jedi. - Sleeveless outer tunics may be fastened at the front. They can have an attached hood (recommended), though a hood is not compulsory. No vests, or sleeveless V-neck type sweaters may be worn as a sleeveless OT. - Must extend at least to or past the bottom hem of the OT on the front. - Tabard width should generally be from the seam at the collar of the OT to the edge of the shoulder and be a similar width as the obi. A general width to use would be 5 inches (12,7 cm) to 6 inches (15,3 cm)wide (depending on one’s height and build). Common sense should be used in selecting Tabard width, and the width should be proportional to the costumer’s body. - Tabard construction should be such that the front tabards do not overlap. This is often accomplished by constructing the tabards in a “Y” formation where any seam joining the tabard below the obi to the tabard above the obi is covered by the obi. - Leather or pleather tabards are permitted. - The back tabards may end under the obi or may extend to (or past) the bottom hem of the OT (or may be the same length as the front tabards). This guideline is obviously for the more traditional length OTs. For OTs that are longer (past the knee or to the floor or where a full length skirt is worn), the tabard length would be more variable. - Tabards may cross in the back. Tabards may be sewn together in the back. - Tabards should not be worn with Ki Adi Mundi style OT or surcoat. Tabards are required with the standard OT style. - Kataginu are not permitted. - Having an around-the-neck design, are permitted. - centrally located (covering the crotch area) is permitted. - The obi wraps around the waist, and should be approximately three times the width of the belt and/or of a similar width as the tabards. - Obi closures (Velcro, snaps, etc.) should not be visible. - Leather or pleather Obi are permitted. - Obi may have borders. - Belts are generally two inches to two and a half inches wide, but the width should be in proportion to the wearer. Very tall or large costumers may need a wider belt. Very short people may need a narrower belt. - Belt closures (Velcro, snaps, etc.) should not be visible. - No Earth-bound buckles or buckles that obviously belong to an Earth-bound period, culture or to other sci-fi/fantasy genres. - Belt and boots should match (be of a complimentary color), i.e., black and black or brown and brown. No black/brown combinations. - Wide leather main (inner, against the Obi) belt with a thinner secondary belt (outer) on top of the main belt, and a movie-style or similar buckle on the secondary belt. - Thinner secondary belt cannot be loose or “sag”. - Button studs should be used to help anchor the outer/thinner belt to the inner/wider belt. Generally, 8, eight button studs (screw posts or Chicago Screws, preferred) are used. Sam Browne button studs are permitted. The metal of the studs should match the metal of the buckle. - Singular wide leather belt with a rectangular, octagonal or oval unadorned buckle. - No toy sabers, no Ultimate FX short saber. 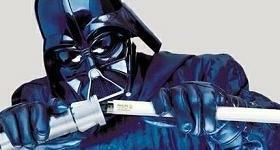 The lightsaber may be a static prop (hilt-only). Attached blade(s), LED lights, and sound effects, are allowed but not required. - Metal hilt lightsabers are preferred, though custom lightsabers constructed of other materials are permitted. - Blade colors accepted are: blue, green, yellow, orange, white and violet. No red, pink or black blades. - Double-blade sabers are allowed. - Covertec or similar style lightsaber clip OR a hook/clip for lightsaber on belt. - For the “hook/clip” type of lightsaber attachment, the lightsaber (itself) will likely have a D-ring (similar to the connection system for the armored Darth Vader and Old Ben lightsabers). - Pants should largely be non-descript without decoration. - Traditional pants pockets are permitted, but must not be visible (e.g., hidden under the skirt of the OT). - Skirts (those separate from the OT) should be long enough so that no bare skin is visible, and may be floor length. - No Corellian Blood Stripes (Han Solo Pants). - Brown or Black Boots – Leather or leather-like (no rubber boots). - Over-the-calfMid-calf, but not above the knee. (motorcycle boots, or "engineer" boots, ~ 14") Extentions like seen in the movie are allowed. - Straps & shin-spats are allowed but not required (though can be used to cover laces and zippers). - Buckles are permitted, but should complement the boot and not detract from the overall look of the Jedi costume. - Low-heeled 1 – 1 1/2 inches maximum. Spike heels are not permitted. - No visible laces or outside zippers. When necessary, inside zippers are permitted. - Boots and belts should match (be of a complimentary color), i.e., black and black or brown and brown. No black/brown combinations. - Mini-Chaps (not above the knee) are allowed. - Earth tone colors, preferably shades of brown, gray, black and white. - Other earth tones are allowed (greens, blues, yellows, violets and reds (where the reds are darker and in the burgundy family)), but should be muted. - No bright or loud (sharp) colors are allowed (examples would include: red, pink, neon green, etc.). - Combinations of red and black are not allowed, as they are considered Sith colors. - Colors of the Generic Jedi costume may be mixed and matched (except for the belt and boots). - Legion Costume Judges are the final authority on color. If in doubt, contact a Legion Costume Judge for an opinion on proposed color combinations before construction. - May be a full tunic or a false tunic (meaning a collar, neck portion and sleeves may be added to a shirt or t-shirt). Dickies or tunics/shirts with a Mandarin collar are allowed. - If the OT is sleeveless, then an IT must be worn and must have long sleeves. - Blouses and standard store bought turtlenecks may be used, but will not be considered ITs for the purposes of costume requirements. - The paint scheme on resin cast boxes should blend well with the overall costume. - Bags are not pouches, and are not permitted to serve as a pouch/box option. - Food pellets should be painted a metallic color and may be gold, silver, bronze, copper or pewter. Other metallic colors are not permitted. - Large Jedi robe or cloak (cape) with attached over-sized hood, similar to Prequel movie canon robes/cloaks, in the same color scheme as listed for the main costume (see #10. above). - A hooded cape with side splits similar in construction that worn by Anakin in Attack of the Clones, is permitted. - The hood should be large enough so that (1) when the hood is up, the sides of the hood drape to extend to or cover the shoulders and (2) when down, the tip of the hood should fall near the small of the back (or lower). - The sleeves should be full and flare larger on the hand end. When the hand end of the robe sleeve is closed, the length of the end of the sleeve should be at least half the length of the costumers arm (or longer). The circumference of the robe sleeve opening (at the hand) should be at least as long as the sleeve (from shoulder to the hem). - The overall body of the robe or cloak/cape should be full. - The length of the robe or cloak/cape should be hemmed no shorter than two inches off the floor. - A generic Jedi may not wear a robe/cloak that is unique to a face character. Example: Count Dooku’s cloak with neck chain. then we should take this opportunity to correct the stuff about Ki-Adi's robe. I think we all realize at this point, that Ki-Adi is wearing a brown jedi robe w/ hood. this is not a sleeveless OT -- this is a sleeveless brown hooded jedi "robe". there are -NO- examples of a jedi wearing a "sleeveless OT", that we know of. this was all based on a mistake , ((which saw Ki-Adi's outer layer as an "OT" instead of a "Robe")). we should take this opportunity to correct the mistake. the standards talk about a "Generally Recommended" form of construction (skirt construction), which is -not- compulsory. and they should not address any "generally recommended" forms of construction. if a full skirt is not required by the judges, then it should not be mentioned in the standards. is in the forums -- not in the list of required standards. we cannot say "mid-calf" , and also say "14 inch is always allowed". because 14" may not be "mid calf" on all human beings. we are all different, and "mid-calf" will mean different things to different people. for some people, 14" will look like ankle-boots -- this should not be allowed, simply because "14inches". 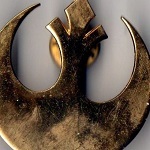 is a left-over from the days when we had 2 sets of Jedi Standards: old republic and new republic. old republic was PT-era, black was NOT allowed; new republic was OT-era, black WAS allowed. -->when the 2 standards were merged, there was a misguided attempt to maintain this "black/brown" distinction, for unknown reasons which make no sense. ie: this "black/brown" requirement comes from a legacy of re-written jedi standards ; it does not come from "movie references". the height requirement for "mini-chaps" is already covered, elsewhere in the standard -- ("mid-calf but not above the knee") -- this does not need to be repeated. - Height Extensions like seen in the movie are allowed but not required. - No visible laces or outside zippers. When necessary, inside zippers on the inseam of the leg are permitted. Locking for the time being.